RAYOVAC FUSION Alkaline batteries. Package of 16 x AA alkaline cells. Longest-lasting Alkaline battery ! 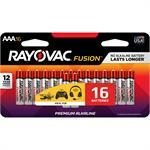 RAYOVAC FUSION Alkaline AAA batteries. Package of 16 x AAA alkaline cells (triple-A size). Longest-lasting Alkaline battery ! 239180: 9.6 volt 2500mAh battery for OTC, Genisys, EVO, Matco, etc. 239180: 9.6 volt 2500mAh Ni-MH battery pack for Automotive Scanners. Fits OTC Genisys, Genisys EVO, Cornwell Tech/Force, Supreme/EVO, Mac Mentor / PRO, Matco Determinator / X-treme, OTC / Mac / Matco Solarity Scope etc. 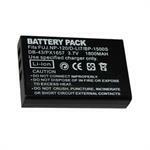 The NP-120 (aka DLF120) is a 3.7 volt 1800mAh Li-ION battery pack for Fuji, Pentax, Ricoh, etc digital cameras. Replaces original part # NP-120. Fits FUJI FinePix F10 Zoom, FinePix M603; Pentax Optio 450, 550, 555, 750Z, MX, MX4; RICOH Caplio RR30, etc. TT15005: 7.2v 2500mAh rechargeable NiMH battery pack for JETT, TechTerm, 80 series handheld computers. manufactured in USA by Batteries America.